Now is the time to stock up on AA and AAA batteries. This week (11/25 – 12/1) Staples is offering 100% back in Staples Rewards on Duracell 16/pack AA and AAA batteries. Limit 2. In-Store Only. Purchase $100 worth of Duracell products and receive a $25 Gift Card by mail*. 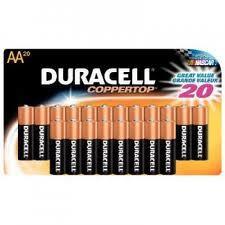 Purchase $100 of any Duracell product between 10/1/12 and 12/31/12. This entry was posted in Deals, Expired, Free Items by mlemon317. Bookmark the permalink.